I know this is a stark contrast from my last two blog post, but I have to say that this recipe is one I just had to share. This recipe is about memories, relationships and the love and hard work of our food community that made it possible for me to make a version of this dish I feel good about eating. I am very picky about eating meat and where that meat comes from. I prefer a vegetarian/vegan diet BUT on occasion I crave dishes that include meat, for us that meat must be local, and sustainable raised without drugs, we want happy healthy meat. When I cook with meat it is usually a special or classic dish like Perfect Roast Chicken or Grass-Fed Beef Stuffed Acorn Squash or even my Fish Tacos, this New Mexico Green Pork Chili fits into that category. The first time I had this dish was at my friend Erin and Nicole’s house for an after Christmas party two years ago, even though they had made a vegetarian Lentil Soup I was drawn to this Pork Chili, I couldn’t get enough! Those flavors were so intense and reminded me of the Chile Verde we ate as kids, up until this point my mom’s is the best Chile Verde I have ever eaten. I had to know this recipe, I begged Erin to share the recipe and teach me how to make it- she said yes. Thanks to Erin for letting me share with all of you. Fast forward a year. Just before Christmas The Downtown Alliance had their second Winter’s Pop Up Farmers Market. Our good buddy Julie Clifford of Clifford Family Farms was there with her goodies, we usually buy eggs and honey from her but this time I was looking for pork. We had just watched the movie‘ Fresh’ and we were curious about how she handles the slaughter of her animals. Julie is very protective of her animals, she shared with us that it is hard for her, and in the past she wasn’t happy with whom was handling this part of her production so she searched out someone who was gentle with that process, (trust me I know there is no gentle way when it comes to this subject). Now she personally walks her pigs in to be processed so they don’t have to be scared. I tear up just writing this because it is not lost on me that an animal was sacrificed for me to make this dish. If you know Julie, you know it’s not lost on her either. I feel very lucky that I can look in the eyes of the person/farmer who is providing the food that nourishes us, that would not be possible without the love and dedication of these people and our community for supporting that and giving us access in the form of Farmer’s Markets and locally owned specialty shops. Next I had to locate chilies, see last summer I was so busy canning and trying to get ready to leave for Italy that I didn’t freeze roasted Hatch chilies. I’m still kicking myself about this! You can’t use any old chilies for this recipe, Erin gets her chilies from her family in New Mexico. This recipe is minimal in the ingredient department so each ingredient needs to be the best. Shipping the chilies would have cost us a fortune so I had to hit up my buddy Jorge Fierro of Frida’s Bistro and Rico’s Foods for help, this all took place over Facebook of course. Jorge didn’t hesitate to help me out with the chilies. When I went down to Frida’s to pick up the chilies from Jorge we had some time to talk, standing in the middle of his Rico’s warehouse I was in awe of what he has built for himself. I asked him ‘how did this all start Jorge?’ He told me that he grew up in Mexico, moved to Rawlins, Wy to be a sheep herder and while in Wyoming he realized he needed to learn English so he moved to Utah to attend the UofU. He told me he went to school during the day and worked as a dishwasher at night, one night on the way home he stopped at the store to get tortillas and refried beans. He was horrified by the beans and started making his own and selling them at the Farmer’s Market. So simple but so impactful. Now you can find Rico’s products in all our local major grocery stores, and Frida Bistro just won Best Mexican at our Salt Lake Dining Awards this last week. As I drove away from Frida’s with my chilies I was humbled by the effort that went into making this dish happen, it took a community. OUR COMMUNITY. ENJOY! Relationships: Social connections help relieve harmful levels of stress, which can harm the heart’s arteries, gut function, insulin regulation, and the immune system. 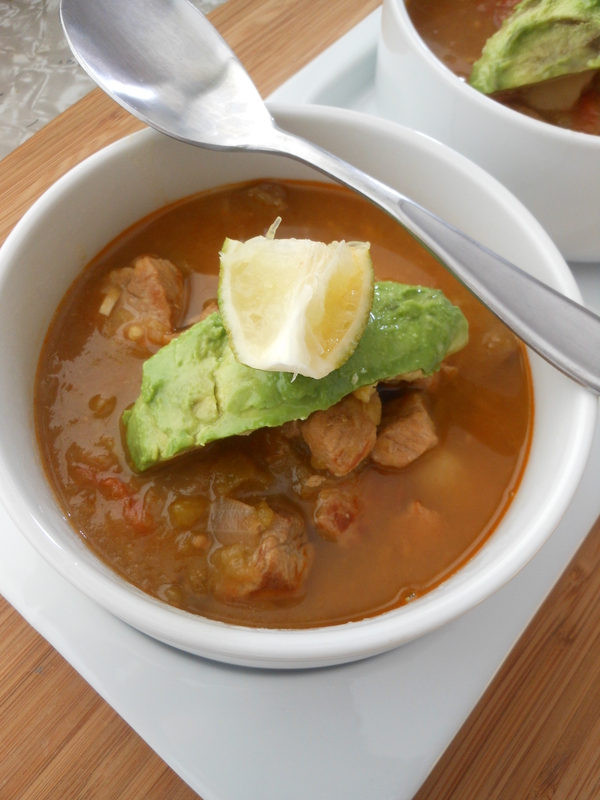 New Mexico Green Chili Pork Stew– makes a lot! 1. Start by placing a heavy bottom pot on the stove over medium heat, drizzle in a little bit of oil. 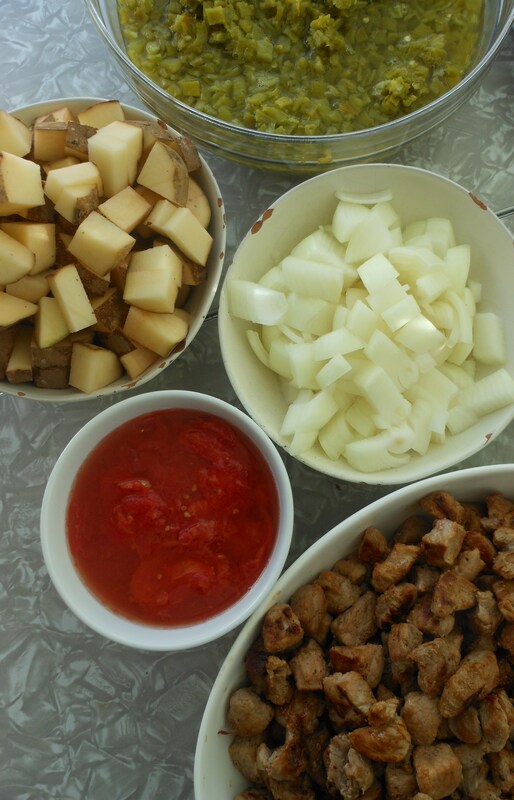 Saute the cubed pork in batches, until just brown on all sides. Season with salt and pepper and don’t over cook. Place the browned pork in a bowl and set aside while you cook the rest of the pork. 2. When you have finished with the pork, set aside. Drizzle a bit more oil into the heavy bottom pot and saute the onion and garlic until soft and caramel colored. Season with salt and pepper. 4. 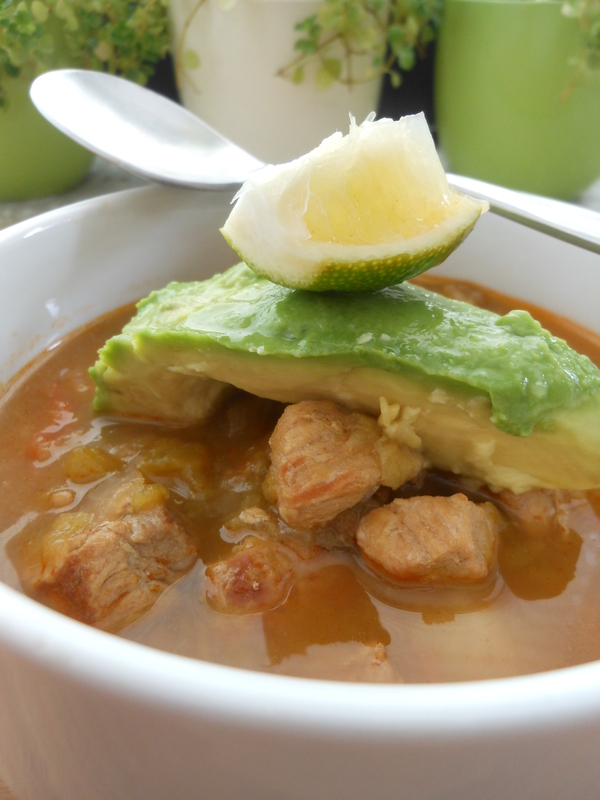 To serve: ladle pork chili into a bowl, add chopped avocado and a squeeze of lime. We topped ours with a dollop Drake Family Goat Yogurt and served a warm Rico’s tortilla on the side. Brooke, I love your new website look! A friend sent me your post for the green chili pork stew which is a classic Colorado dish. I liked the recipe and then decided to check out the rest of the site…only to find out it is yours! Now I’ve got it tagged so I will check back regularly. Thanks Jane, hopefully this pork stew is up to Colorado’s standards. We loved it! Good to hear from you and thank you for your kind words about my blog.